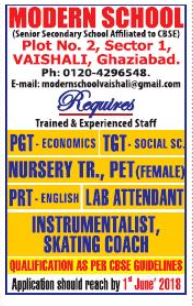 Modern School, Ghaziabad has advertised in Hindustan Times Newspaper for the recruitment of PGT plus PRT plus TGT job vacancies. Interested and eligible job aspirants are requested to apply with in 1st June 2018. Check out further more details below. About School: In pursuit of fulfilling the aims and objectives of the society, Digamber Jain Society for child Welfare (Regd.) had set up school at Vaishali in the year 2002 on the G.D.A allotted land with the aim of creating a culture of excellence among the budding children & providing qualitative education.